Die hard had an extremely good reputation, and in fact this was deserved. The action film set the trend for all that followed and made Bruce Willis a household name. The Lacklustre although successful sequels never really captured the strength of the original but were still thoroughly popcorn entertaining. 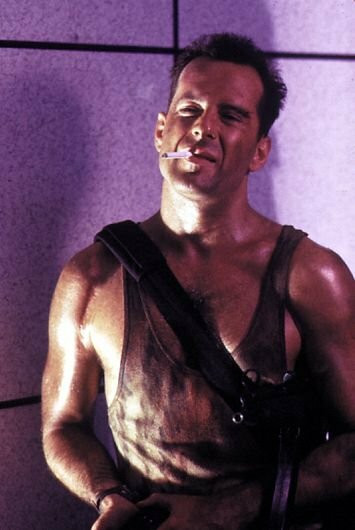 Bruce returns to the role and in this outing he looks the part if a little full of back pain, in Die Hard 4 , released on DVD recently. The film understands it routes well, and has obliviously followed its marketing department by toning down the swearing and violence and upping the visuals that lacked in the originals. A smarmy bad guy kidnaps the hero’s daughter in a quest to bring a hacker into the open that is protected by the yippy Kay himself. John McLean. With a rate of family danger that puts Jessica Fletcher to shame, Brucey goes into overdrive and does what he does best, whilst quipping and smiling for the camera. Bruce has himself enough Charisma to carry the plot holed film through to it’s inevitable conclusion, but as a final film for this character the film acts well, and makes a suitable DVD purchase for the OCD collector , or someone wanting a good boys own film. In Die Hard 4 you do ask are you getting too old for this sh…..